hello! i'm back to share my layouts for studio calico july kits - penny arcade! i'm sorry that i am late in sharing this blog post as june has been a very busy month for me! this month's kit is one of my favourites! i love love love the colours! and the papers from ashley goldberg! and the exclusive cut files are just as amazing... glad i cut a whole bunch of die cuts with my silhouette cameo! i was happy to work with the main scrapbook kit, skee ball (add on 1), fortune teller (add on 2) and spun sugar (add on 3). 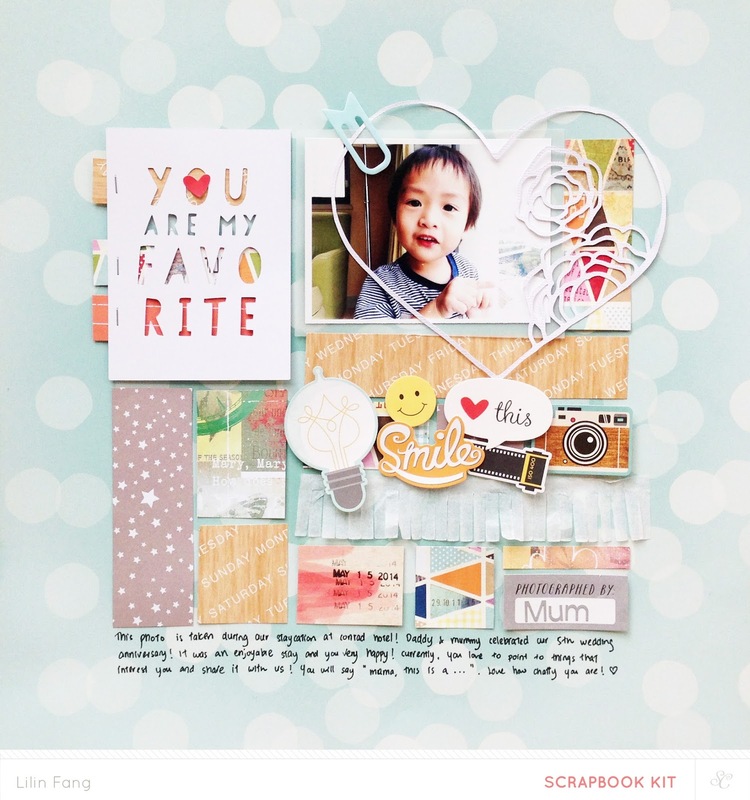 if i have to choose one favourite this month, it will be the main scrapbook kit! love the ashley goldberg papers, the lovely brush script travel journal paper, cute cloud paper by life-love-paper and stamp stickers! 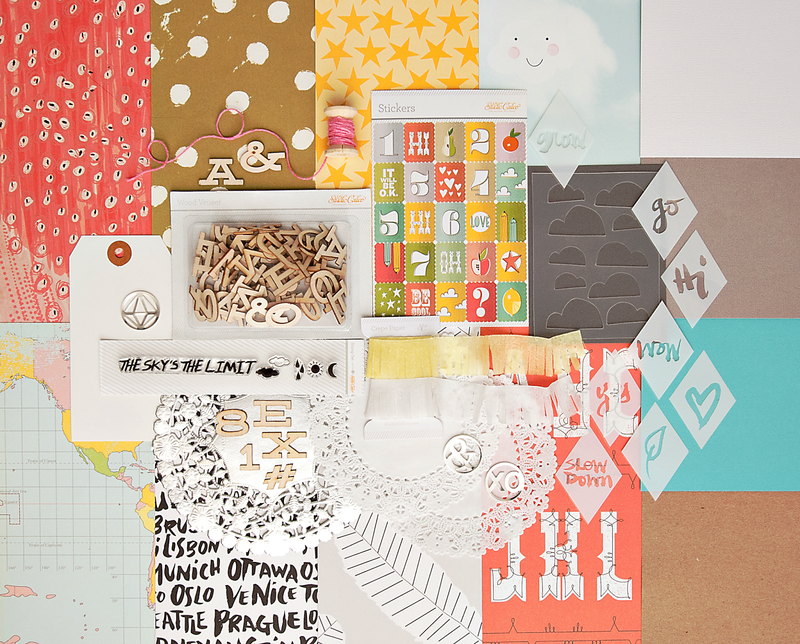 the kit is filled with lots of exclusive papers and embellishments! the patterned paper in the kit are so pretty, i wanted to use as many as i could on a layout so i decided on a grid design. i printed 3 photos in 3 x 3 inch and cut 4 patterned paper into 3 x 3 inch squares. after deciding the placement for the photos, i layered each one with a piece of vellum. for the first square, i used some pink thread and hand stitched the city - london since my photos are of my trip to london! i love the stamp stickers so i cut part of it and used it as one of the squares on my grid. i wanted to keep the design simple so i decorated the rest of the patterned papers with a doily and some die cuts from kim steward and in a creative bubble. then i thought this page could do with more yellow, so i trim a 3 x 3 square from white card stock and colored it with some gelatos. i used lemon and buttercup yellow here. then i stamped "the sky's the limit" with color theory sunny day. to finish off, i added my journaling, date stamp and a small strip of white crepe paper. when i saw this cute cloud paper, i thought it's perfect for scrapping ethan's first photos! 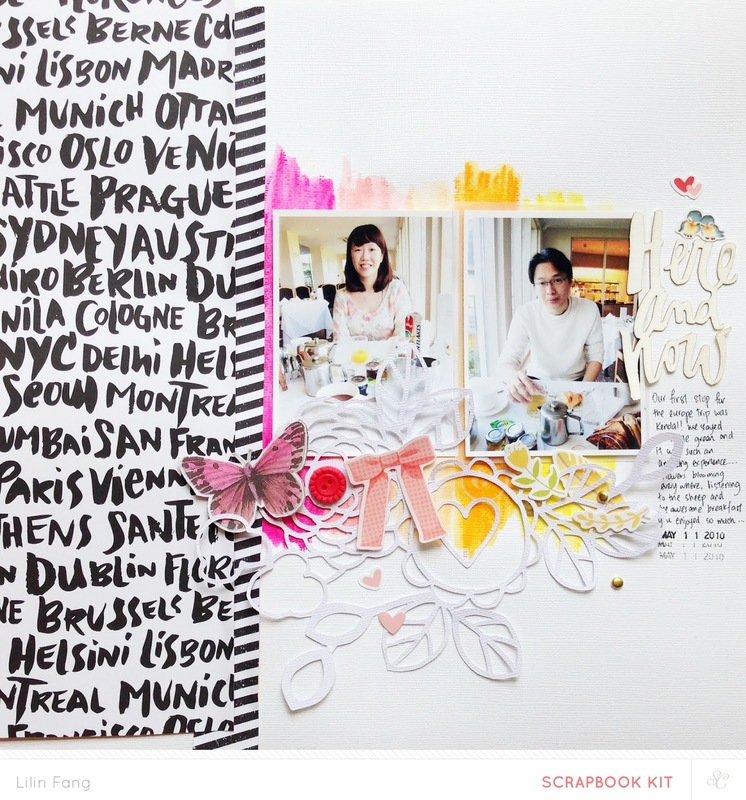 love how well the clouds die cuts by paige evans complements the cute clouds on the paper. after i decided on the placement for the photo, i layered it with vellum, a doily and patterned paper. i place some white crepe paper beneath the photo like a little banner. i also added a cluster of embellishment at the side of the photo with the stamp stickers, flower die cut by hello forever and xo metal circle badge. to make the die cut clouds stand out, i outline them with my precision pen. used mostly fortune teller in this layout. 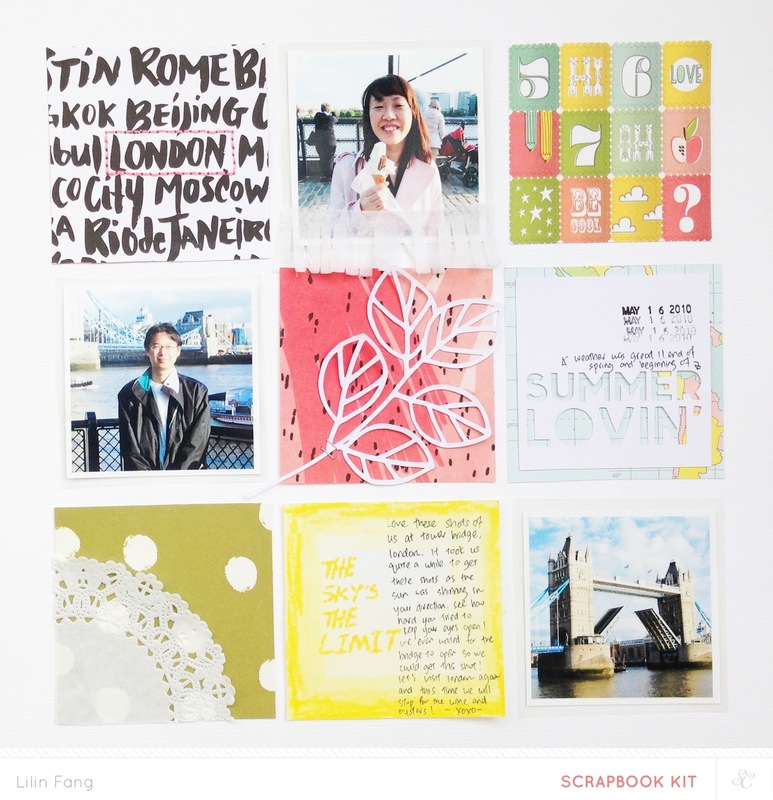 just like my london page, i wanted to use as much of the pretty patterned paper as possible so i cut the papers into little rectangles and place them together with my photo, some crepe paper and journaling card by hello forever, something like a jigsaw puzzle. this is why i love working with a kit for such a design, because the papers are well coordinated and i don't need to spent time making sure they look good together. then i started layering the october afternoon stickers and used the heart shaped die cut by kim steward to frame my photo. to make the words 'you are my favourite' stand out, i cut strips from the patterned papers and layer it beneath the journaling card. i started this page by coloring some gelatos on white card stock. then i added some black and white strips of patterned paper on the left hand side of the page as a contrast to the colourful background. i place my photos in the middle of my painted background and added a floral die cut by kim steward. this die cut is my absolute favourite! love how the colors peep through the die cut. to add more interest to the page, i layered some stickers, gold enamel dots, buttons and the little butterfly i cut from under the boardwalk paper from fortune teller. lastly, i added the now and then watercolor die cut, journaling and date stamp. i hope you have enjoyed my reveal of penny arcade and i will be back soon with a tutorial for one of the layouts! also, the enrolment for inked 2.0 is almost closing, if you are interested to find out more about the class, click here!